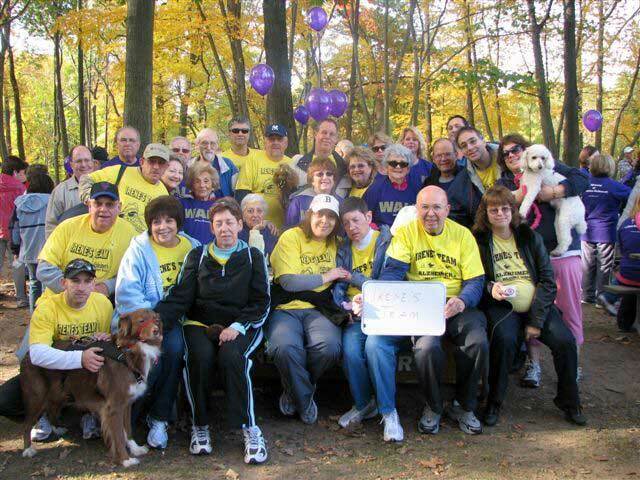 This is the second of two “official” team photos, showing the largest turnout of walkers experienced by Sid and Irene. Sid thanks those who joined him for the Walk in 2010. For more pictures of Irene’s Team from the 2010 Alzheimer’s Memory Walk, visit Sid’s Picasa page. As many of you already know, my wife, Irene, had been diagnosed with dementia, the most common form of which is Alzheimer’s, in December 2002. As expected with this condition, there continues to be some deterioration, and this has been quite noticeable the past year. Nevertheless, we try to continue doing as best we can, given the situation, and we have been able to do our usual amount of traveling and socializing with friends and relatives and participating in Sid’s bus and rail groups, as much as we can (especially ERA). We have also introduced respite care into the equation. You also have the option of making your supporting contribution online at www.alznj.org. Click on “Memory Walk 2010” in the list in the left margin and then hit the “donate” link to get to the Memory Walk 2010 home page. Once there, enter “Irene Keyles” as Participant’s Name and click “Search”. When “Irene Keyles” appears, proceed by clicking on her name, after which you can make an online or offline donation in Irene’s name, which will be credited to Irene’s Team. If you do not want to be a sponsor, that will, of course, be OK. We welcome your moral support. We have been pleased to have many friends and relatives walk with us in past years and really would like to encourage more of you to walk with us this year on October 24th. We have, again, registered “Irene’s Team” for that purpose. If you are interested in walking with us that morning, please let us know.